When I tell people about my tiny house, and their brain starts to wrap around the concept, it's not long until their thoughts lock onto the loo. Or, as Deek says, "The number one question is about number two." In the United States, nobody likes to talk about human waste. It's a taboo subject - folks prefer to just pretend that doesn't happen. Guess what? It happens! There is something categorically wrong with us using drinking water in our toilets when we have a fresh water shortage. What in the world are we thinking? And why aren't areas who have been in drought for years addressing that topic? It's ridiculous. In the last month, I've made myself more familiar than I ever thought I would be with toilet options. I'm nearing the launch of my construction, and it's time to seriously consider what has to fit where. 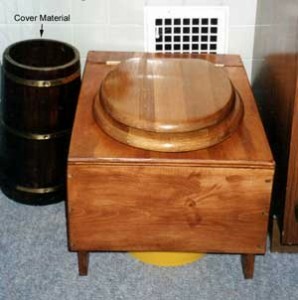 First up are the toilet and shower pan, because they are in an enclosed space. A finite space. The shower pan I'm not too concerned about - there are lots of conventional and non-conventional options there - and I've pretty much made peace with not having a bath tub. I don't take a ton of baths, and since I hope to be mostly off the grid, my water will come from a holding tank under my house. A bathtub requires a substantial amount of water. So, I've let that go. Of primary concern in the shower, though? Adequate space to shave my legs. Oh, you men - you laugh - but having showered and attempted to shave my legs in the shower on my niece's (lovely and oh so fun) houseboat on the Potomac in DC, I'm quite aware of the challenges in that department. I mean, I am limber, but ... ANYWAY, the shower is a topic for another day. And so then the toilet. I never even considered a water-based toilet because I don't want to deal with the black water tank. The other options I have identified are the bucket with sawdust (I see you shirking back! 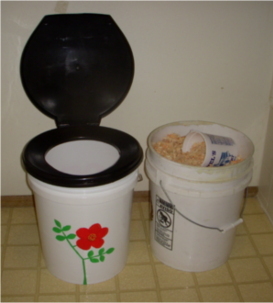 lol) which I affectionately call the Thunder Bucket, the composting toilet, and the incinerating toilet. There may be others - Daniel mentioned a camp toilet but I am not sure if that is a fourth category or if it falls into one of the previous 3 categories; I need to look that up again. 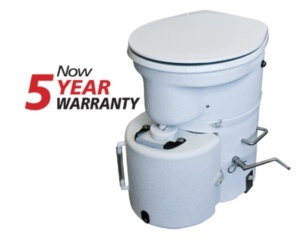 For the people who have gotten past the taboo of human waste, the off grid toilet becomes a comedic topic - humor is the great diffuser, right? There's the Thunder Bucket, the Thunder Box, the Loveable Loo, and then the accompanying videos - oh MY. I mean really -- oh. my. I've spent a few hours on YouTube, watching waterless toilet videos, and a good part of that time I've spent laughing. Just imagine the set up. It's two friends, one with a video camera, and then a toilet of some kind. "Okay, so we are in my bathroom..." Just that start right there - it makes you laugh. You just KNOW before the camera started rolling they were both just totally cracking up and rethinking the entire thing. But onward! The incinerator toilets were the funniest. Without fail, all the videos I found for the Incinolet were done by men. That's not a stretch - there is actual FIRE involved. Yes, it reduces your poo to powder. That's powerful. But the extreme humor there is that nearly every guy who made these videos seemed compelled to impersonate The Great and Powerful Oz. Ohhh, I was CRYING at my computer! "The steel jaws yawn open wide and -- FIIIIIIIRRRRRRE." Really - if you have time to burn (arr arr) you must Google the videos - high entertainment values. And then the guys who try to be serious about it just end up being funnier to me. Approximate price of the Incinolet? $1,800.00 plus propane. Initially I thought the incinerating toilet was what I wanted. 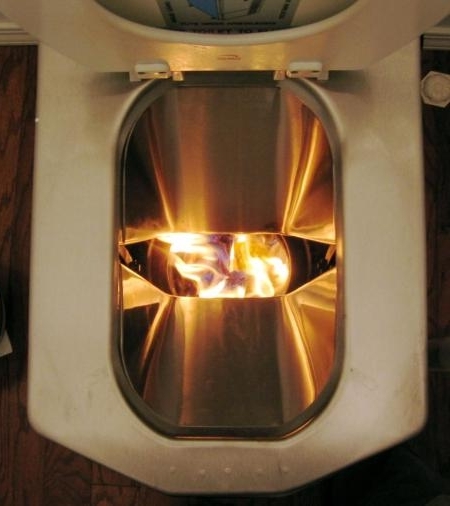 Until I read that the "burn cycle" for poo is 30 minutes. And, well, most folks said it stinks. Not a huge leap of faith to believe that, even if it does have an exhaust fan. But a 30 minute burn cycle seemed (a) loud - although I have not confirmed that; and (b) a waste of propane (there is also an electric version.) I don't really think there is any reason to pulverize your poo into powder. It's a bit over the top. I would worry all the time about burning my tiny house down. But look how happy this woman looks - in her dress clothes, attending to her Incinolet. Next up was the Thunder Bucket. I've joked about this one with Tom for months. Basically you get a 5 gallon bucket from Home Depot or the like. You affix a toilet seat (they sell them that just snap on.) In one video that I saw, for the lid (not the seat - the lid,) you take the lid off the hinges, flip it over so that the rounded top part of the cover nests into the seat, apply some strips of foam that will create seal. You put a heavy duty plastic bag in it (let's use black, not clear, shall we?) throw in some sawdust. Do your business, and throw in some more sawdust on top. Liquids, solids and TP all land in the same place. 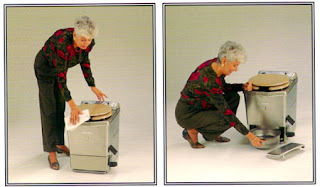 When convenient, pull out the bag and dispose. And how to dispose? It depends on where you are, and how long you will be there. If you are living someplace for a long period of time, you can actually compost that and it will turn into great soil. (I know! But it does!) There is a whole book on that called Humanure Handbook. You can get a free download here: Humanure Handbook. If you are moving about and aren't in one place long enough to compost, I would put a twist tie on it and drop it into a big dumpster somewhere. My issue with that is that it ends up in a landfill, in plastic. Just like the billions of diapers that end up there every day. My counter to that is, well, I'm sure I could find bags that decompose, and even if not, I am at least not wasting drinking water. That ought to counter the landfill issue a little bit. Approximate cost? Whatever a bucket, a toilet seat, and a brick of peat moss cost. Not much. And you can build it into a little box if you want to improve on the bucket appearance. Have you used either one? Do you have any advice for me? I must admit - I'm giggling. I know I am freaking out so many of my friends and family... Ahhhh ha ha ha ha Yeah, baby, I'm choosing one of these! LOL At this point it doesn't even seem weird to me. That's so scary. I love your toilets exploration! And the potty humour :-p The Humanure Handbook is BRILLIANT! I first heard of it when I was working on an organic farm in the hills of Napa. I've read most of it via the online version, but just ordered a copy for myself. I'm going to go with a sawdust/"thunder bucket" toilet. Space, simplicity, affordable -- and a lot of tiny housers seem to swear by it. 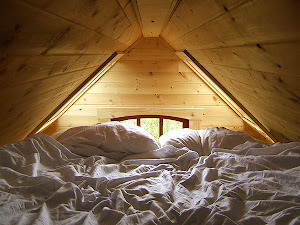 I'll be giving it a go in my studio cottage later this month, so I'll let you know how I like it! Hannah! Yes I have a couple of friends who are going the bucket route as well. It seems the most hassle free method... let me know how it works out for you... : ) Thanks for stopping by!